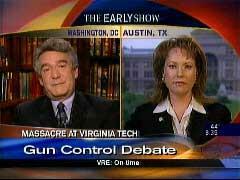 On the last half hour of Tuesday's Early Show, guest co-host Maggie Rodriguez moderated a debate on gun control between gun control advocate Paul Helmke and gun rights advocate Suzanna Hupp. Rodriguez threw softballs to Helmke. For example, if tragedies such as the Virginia Tech shooting "are happening because there are too many guns in the United States? "and very bland questions like "what do you think about that?" On the other hand, she asked much tougher and very biased questions to the gun rights advocate, Suzanna Hupp. Rodriguez noted that her parents were killed in a cafeteria shooting and commented that "some would that, that would make you a bigger gun opponent." When Suzanna Hupp noted that the scenario may have been different had Virginia Tech students been able to defend themselves, Rodriguez returned to Paul Helmke and called Hupp’s comments "controversial." Rodriguez’s final question to Hupp summarized her stance on gun control. "I think that's the one thing that we can all agree on no matter where we stand on this issue. We don't want guns in the wrong hands. So Suzanna, what is wrong with gun control? What's wrong with laws on assault weapons, background checks, gun registration?" MAGGIE RODRIGUEZ: Virginia has very few gun restriction, as we've been reporting. And Monday's incident raises the question, would tighter gun laws make a difference? Paul Helmke is president of the Brady Center to prevent gun violence, a leading gun control group. Suzanna Hupp lost her parents in a 1991 massacre at Luby's cafeteria in Killeen, Texas. She supports carrying concealed weapons. You are both joining us live, and we thank you and we welcome you. Good morning. SUZANNA HUPP: Good morning. Thank you for having us. RODRIGUEZ: Thank you. Paul, let's begin with you. As you know, Virginia Tech is just the latest in a long list of mass shootings in this country. Do you think these things are happening because there are too many guns in the United States? PAUL HELMKE: It's, it's clear to me that what we're doing now is not working. It's too easy to get too high powered weaponry too easily in this country. It's been eight years since Columbine, we've done nothing as a country. It's been six months since the Amish school shootings, we've done nothing as a country. We need to be asking our elected officials what they can do to prevent people from getting these kind of high-powered weapons. RODRIGUEZ: Suzanna you were with your parents at the Luby's when a gunman opened fire, killing them and 21 other people. Some would think that, that would make you a bigger gun opponent. But instead it propelled you to being a very staunch gun supporter. Why? HUPP: Absolutely, absolutely. Well, first of all, I've got to tell you that my heart just is so sickened and saddened by this event. My heart just goes out to those people. I've been there, I've done that, and I know what they're going to be going through. But it angers me, too, because I do think it was largely preventable. I, I do agree with my counterpart on that. But I think it was preventable in a different way. I don't understand why our -- in fact it amazes me that our politicians don't get the fact that these mass shootings only occur in places where guns aren't allowed. They occur in gun-free zones. Think about it. Columbine, he mentioned, post offices, day care centers, other schools, universities. Why are we removing my teachers' right to protect themselves and, and the children that are in their care? RODRIGUEZ: Suzanna, you say if you had had your gun the day that your parents were killed, you could have been able to make a difference. You believe that? HUPP: There is absolutely no doubt in my mind that things would have been different that day. And I believe in this particular scenario, when Virginia Tech stood up in front, apparently stood up in front of a hearing and said that they didn't want people to be able to protect themselves on campus. At that point, they had the responsibility and the liability to protect those people and they didn't. You basically are creating a shopping list for a madman. Somebody who wants a high body bag count goes to a gun-free zone. RODRIGUEZ: Let's bring in Paul on this, because those are pretty controversial comments. What's your response? HELMKE: Well, actually, it's a legitimate point that's raised. Part of the thing is, we have politicians who don't even want to talk about any of these options whether it's more guns, less guns, tighter controls or not. Most politicians just run away from this issue. And we need to start asking them what their proposals are. And maybe there's a way to even fit some of these things. Maybe if you've got strict licensing and permitting and registration, then you might be able to have more guns. But actually, these killings occur all sorts of places. Fairfax, Virginia, police station, just 11 months ago had two police officers killed at the police station. We make it too easy to get these guns. Let's prevent these folks from getting these guns in the first place. Then we can argue about how best to react when they're coming to the shooting. If they can't get that gun with that high-powered clip that's shooting off that many rounds that quickly, then we're making our whole -- our community safer. RODRIGUEZ: I think that's the one thing that we can all agree on no matter where we stand on this issue. We don't want guns in the wrong hands. So Suzanna, what is wrong with gun control? What's wrong with laws on assault weapons, background checks, gun registration? HUPP: Well, let's make it very clear that there's a confusion out there. He did not have automatic weapons from what I understand. He had semiautomatic, which means that he basically had to pull the trigger each and every time he shot somebody. He could have had revolvers for all that mattered. The point is that people need the ability to be able to protect themselves. When you make gun laws like this, it only takes the guns out of the hands of the normal sane people if you will. It keeps them from protecting themselves. None of the mass shootings have occurred in places where guns were allowed. You don't see these things happening at NRA conventions or the dreaded gun show that you all talk about frequently. RODRIGUEZ: So Paul what do you think about that? RODRIGUEZ: How do you do that? I want to hear from both of you. RODRIGUEZ: Hold on, Suzanna. Hold on Suzzana. Let him finish. HELMKE: But it's, it's basically -- we've proposed a number of things over the years. Whether it's assault weapon bans, background checks, extending the background checks to all sales. In Virginia, you don't have to go through a background check if you buy from a non-licensed dealer, a non licensed seller at the gun show. Ban these high capacity clips. Ban the guns, military style weapons that can do the sorts of things. Stop multiple sales of handguns. Look at registration licensing. There's a lot of things. But nobody has done anything. RODRIGUEZ: Let's get Suzanna's take on this in the last 20 seconds. How do you keep the guns out of the hands of the bad guys? HUPP: I don't think you can. But I do think -- anymore that you could keep machetes or chain saws out of their hands. I do think that you can allow people to protect themselves. Because if you don't, things like this happen. You cannot name me one place where a mass shooting has occurred where it wasn't in a gun-free zone. I want my children protected. I want my teachers to be able to protect themselves. RODRIGUEZ: Sorry Paul Helmke, we are out of time. We appreciate it. We have not heard politicians address this too much. And they're, I'm sure, going to wait to hear how this gunman obtained his weapons.